Giants of the Monsoon Forest - Description | W. W. Norton & Company Ltd.
From the kings of the Indus Valley to Hannibal’s Alpine cavalry, humans have been living and working with elephants for millennia. 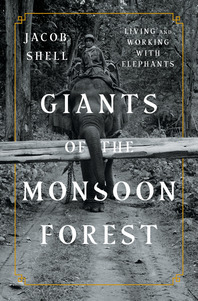 In Giants of the Monsoon Forest, Jacob Shell travels to communities that still rely on this ancient partnership. After the 2004 tsunami, Indonesian officials deployed trained Sumatran elephants to clear wreckage. Along the mountainous Indian-Burmese border, the logging industry employs several thousand elephants. They share these forests with Kachin rebels, who navigate a secret network of trails atop elephant mounts. Blending history, science and reportage, Giants of the Monsoon Forest offers a new perspective on animal intelligence and reveals an unexpected relationship between evolution in the natural world and political struggles in the human one. By working together, fugitive elephants and humans help preserve the wild spaces they both need to survive.